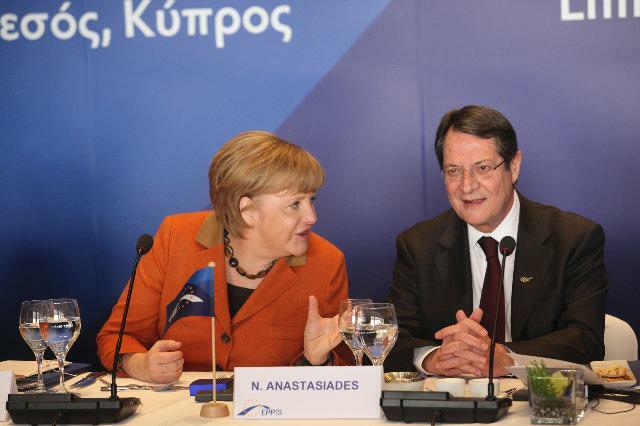 Angela Merkel, German Federal Chancellor, on the left, and Nicos Anastasiades Cypriot President. (EC Audiovisual Services). Eurogroup’s decision to impose a haircut on all bank accounts held in Cypriot banks, even on balances bellow the until today “theoretically” guaranteed benchmark of €100,000, may become a boomerang for the entire Eurozone and will certainly set the island once more on fire. Who is to say that this will not have a devastating effect on bank deposits in more euro area countries like Italy, Spain, Portugal and why not Ireland or France? By the same token one may think that the surplus Eurozone countries, like Germany may even be favoured by this haircut on all Cypriot banks. Let’s see why. Everybody remembers that last summer, during the difficult times for Eurozone, exuberant risk premiums on loans to Italy and Spain sent their borrowing interest rates to the sky at 6% and 7%. At the same time though, the German treasury was favoured by negative borrowing costs on its own bond issues. Is Berlin trying again something like that to convince investors who is the most reliable borrower? Capital markets had already learned by then, not to take the Eurozone as one solid package, that cannot be dissolved. At that time the German government ‘discovered’ the term “systemic” and “non-systemic” Eurozone countries. Wolfgang Schäuble, the German minister of Finance said loudly this past week, that Cyprus is not a “non-systemic” Eurozone member. Even if it was, this statement made the island an expendable euro area economy. Putting all that together one may arrive at the conclusion, that with this generalised haircut on Cyprus, Germany is not only managing to avoid paying the full price to salvage a fellow Eurozone economy albeit tiny, but also to gain from Cyprus’s deeper troubles, aiming at holding the island as an economic hostage. The Berlin high command knows a lot about hostages. As a matter of fact the decision to give a haircut to all Cypriot bank accounts was announced last Saturday morning, after a 10 hours meeting of the 17 Eurogroup ministers of Finance. The main item on the agenda was how to bailout the really overweight Cypriot banking industry and also save from bankruptcy the Cypriot Republic. According to this agreement, bank accounts with balances below the €100,000 benchmark will receive a haircut of 6.75% and above this amount the haircut will be 9.99%. On top of that Cypriot banks will be put under scrutiny for the legality of their practices. This means that western auditors will be able to access banks accounts and information that may be of geopolitical interest too, given that a lot of Russian citizens are old customers to the island. As for the proceeds of the haircut they will be transferred to a Cypriot Republic’s account and along with another €6 to €7 billion of Cypriot taxpayers’ money plus €10 billion in loans from Eurozone, will be used to recapitalise the banks of the island. It must be noted that the Cypriot banks have assets and liabilities surpassing eight times the GDP of the Republic. Their problems began when the Greek government bonds lost 53.5% of their nominal value in March 2012. The Cypriot banks were loaded with such paper. Reportedly the banks of the divided island have accepted deposits of a value of anything around €16-€18 billion from Russian citizens, under relaxed control conditions. In view of this a shake-up of the anti-money laundering practices followed by Cypriot banks, will be realised the soonest possible. As mentioned above this auditing by a major western firm may annoy some of those Russian depositors. To this effect the Cypriot President is to travel urgently to Moscow on Wednesday or Thursday, probably also ask for help. The West is not looking forward only to start a deep digging into the Russian bank accounts of Cypriot banks. Brussels, Berlin and more so the IMF from Washington all demand that Moscow contributes anything between €2 and €4.5 billion to the Cyprus bailout. This affair has become a major issue in the German media. All German taxpayers are being told or probably pounded by major media with the ‘information’, that they will be protected by their government from paying to salvage the Cypriot bank accounts of Russian oligarchs. Consequently the oligarchs will be forced by Angela Merkel and Wolfgang Schäuble to pay for their own salvation. Germany is holding general elections in September. Surprised? No! Incidentally if the haircut on bank accounts above the €100,000 benchmark has any sense in relation to Russian oligarchs, why Berlin insisted on penalising small depositors too? Whatever the reasons for the failure of the Cypriot banks, the haircut imposed to deposits below the €100,000 benchmark, is beyond any logic. It casts a permanent dark shadow over Eurozone’s financial system, mainly in the South. It also creates a big question mark over the credibility of EU institutions. At this point it has to be reminded that the European Commission, at the culmination of the Greek crisis on 12 July 2010, published an announcement to soothe the worries of EU bank depositors, saying that savings accounts up to €100.000 will be reimbursed within 7 days, in case of a failure of a Eurozone bank. Due to the special weight of this Commission announcement, here below is quoted the most relevant part of it: “As part of its work creating a safer and sounder financial system, preventing a future crisis and restoring consumer confidence, the European Commission has today proposed changes to existing European rules to further improve protection for bank account holders and retail investors… For bank account holders, the measures adopted today mean that in case their bank failed, they would receive their money back faster (within 7 days), increased coverage (up to € 100 000) and better information on how and when they are protected”. The announcement didn’t contain the slightest differentiation in relation to the coverage for home and foreign depositors. It was a plain and clear guarantee, undersigned by the Commission with a reference to future crisis. Michel Barnier is still a European Commissioner. The blow to Commissions’ credibility is now irreparable. Will the haircut be voted? In any case the Cypriot government has presently major political problems to pass the haircut in the island’s Parliament. President Nikos Anastasiades’s party DHSI controls only 20 sits in the 56 deputy legislature. The junior partner of the government coalition, the smaller DHKO party, can offer another 8 votes. Even if there are no internal differences, 28 ‘yes’ are one short from a Parliamentary majority. Seemingly this was the reason for the postponement of the Parliament vote, which was planned for Sunday afternoon.